The world of comics is ever changing. New books get greenlit, series get canceled, and every now and then we see a death…or a death gets retconned. So, it’s more than likely that you, as a reader, will miss something you might really enjoy. There’s no shame in that. It’s a busy industry, but that’s why I’m here: to spotlight a series you might like that maybe slipped under your radar. That’s especially true for the six-issue mini-series, Legends of Tomorrow by DC Comics. Sharing the name of the third DCWverse live-action series, Legends of Tomorrow focuses on four of DC properties that should be familiar to older fans, telling either origins or new tales featuring classic characters. In this particular book, Firestorm, Metamorpho, Sugar & Spike, and The Metal Men get their stories told. 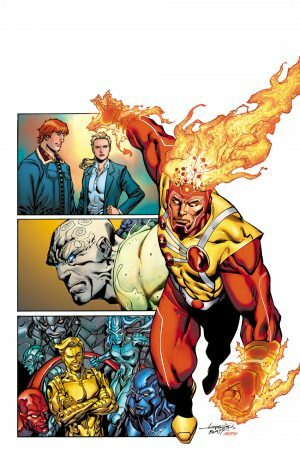 Firestorm has the distinction of picking up where The Fury of Firestorm left off. Metamorpho doubles as Rex Masons’ origin story as the Element Man, while The Metal Men and Spike & Sugar serve as a continuation of the characters adventures in the DC Universe. After reading back through this series, I can say that I enjoyed a lot of the writing in the book. Metamorpho surprised me by how good a story it was. Aaron Lopresti took a character I didn’t much care for and made his story pop to me with an interesting mix of Science-Fiction, Fantasy, and familiar characters. Likewise, Bilquis Evely was the perfect choice to revamp a classic like Sugar & Spike. It was the type of art that felt like the natural evolution of the artwork of classic Silver Age books. Metal Men, though, was the standout story for me. The art, by Yildiray Cinar and Trevor Scott, matched seamlessly with Len Weins’ writing. The appearance of characters like Red Tornado and Cyborg felt very natural. If I were going to give any story from this book an ongoing, Metal Men would be the one—especially with the addition of a new member to the group! I think Legends of Tomorrow was a bit a misnomer. These are classic characters, in many instances simply updated, but managing to retain their casts, incorporate new ideas that feel natural and hopefully as attractive to new readers as they were in their heyday. If any of these characters interest you or you’re curious, Legends of Tomorrow is well worth a read!